Toll- free numbers, as we know are a fixture in the corporate sector. It carries a 50- year- old history at it's back- that is several lifetimes ago in the telecommunication world. Did you know? The very first 'automated collect call' number was introduced by AT&T in 1967. It's very wrong on our part to think that toll- free numbers are out- dated. That they are old and it's no big deal to make unlimited calls. 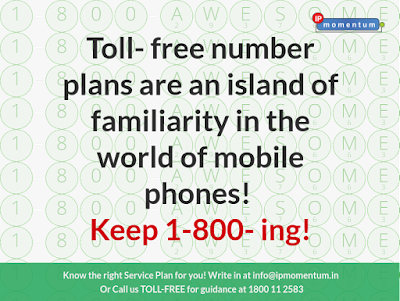 Yes, you can be forgiven to think so ill about toll- free number plans. However, that's how it all began- communicating from one country to another at cheap prices and most importantly, connecting with all! Also read: Why do Small Businesses Need to Adapt to Small Business VoIP? Those '1-800' numbers are still huge businesses and are regarded as extremely valuable assets to those who make use and deal with them every day! Here's a question for you- does your company require a toll- free VoIP plan? If so, how much does it cost? What are it's benefits? Most importantly, what's the best way to get one? It always makes more sense to know how toll- free numbers work, how they've changed in recent times and their benefits before you plunge into anything more complicated. The history of the toll- free number (1-800) is extremely fascinating but, all you need to know is that they do not come free of cost. The original set- up was that it was a courtesy to customers as they would make expensive long distance calls. With this business, the call started playing the charges, not the caller! Back then, when this idea was fascinated, the toll- free rates were extortionate, a lot more high than regular calls. Which is why, toll- free number plans were used by big businesses who were capable of handling the expenses monthly. Later, came Bezerk, the company which made toll- free numbers accessible to a wide range of businesses. Post this, came vanity numbers wherein, the numbers were too easy for the public to remember- 1-800- Burgers anyone? Toll- free number VoIP service plans in India and several other countries were introduced to just one service provider- once you left it, you had to leave the number behind as well. In the year 1933, the FCC passed a rule that all 1-800 or toll- free numbers must be portable. With so many positive developments, toll- free numbers in USA, etc. became popular and FCC reserved more prefix numbers- from 822- 888. Getting your brand's toll- free number definitely legitimized you in the business but, it gives you national presence as well. Toll- free number plans help businesses grow on a national and international level which is what each business needs! The moment you print your toll- free number on your marketing materials, it's extremely busy to get your customers or potential leads! They can call you from anywhere and psychologically speaking, 1-800 number is still very powerful. They assume it to be a free calling number and call without thinking twice. Vanity numbers- easy to remember but, difficult to forget! A survey found that 84% individuals remembered a billboard toll- free number in a span of a few seconds, 72% heard it over the radio and so on. With multiple toll- free numbers, you can text your marketing campaigns better. Each number takes care of each campaign, determining the success of each of them. 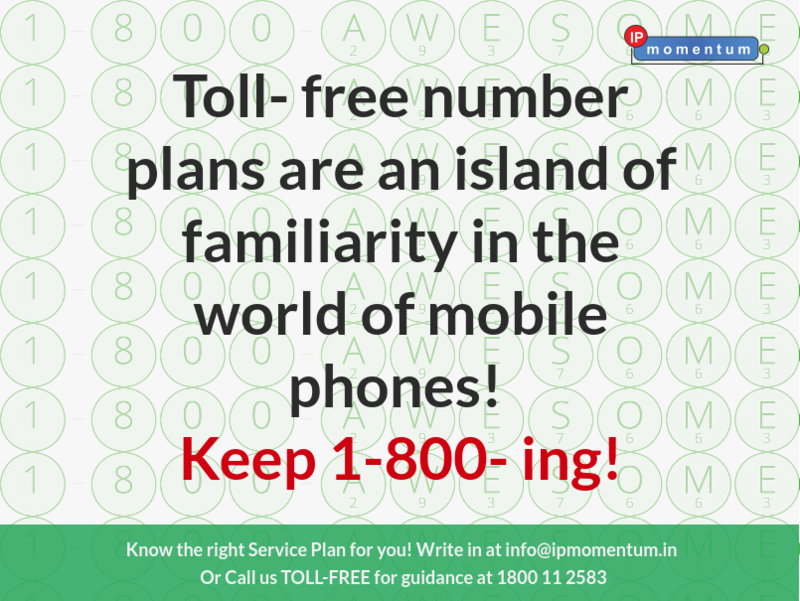 Toll- free number plans are an island of familiarity in the world of mobile phones! Dramatic but, true- a 1-800 number centralizes things no matter what your location is or, how scattered your mobile workforce may be. One contact number and, all will reach you no matter where you go, what you do. Most importantly, you don't even have to change your business cards all the time as the number is the same!